Setting I. 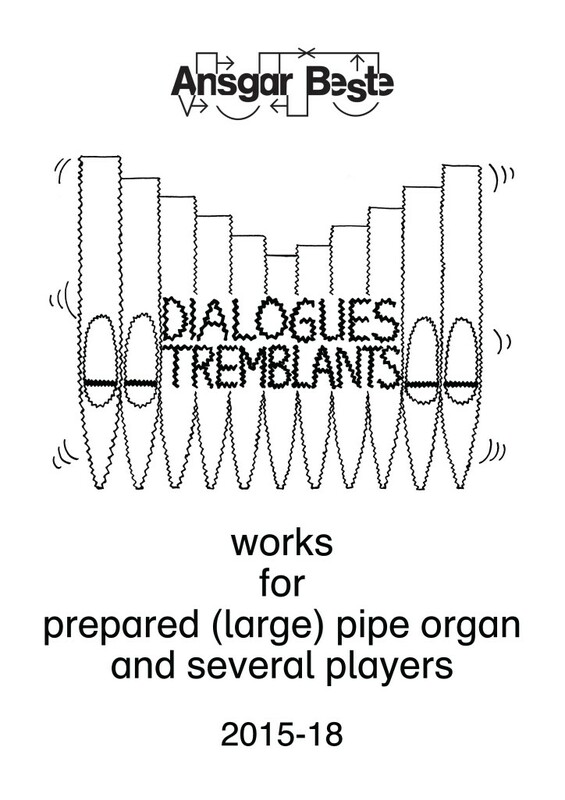 Prepared (large) pipe organ (two players) – improvisation. II. Prepared (large) pipe organ (three players), prepared contrabassoon and prepared tuba. III. Prepared (large) pipe organ (three players), prepared soprano and prepared clarinet. Period of creation 2015-01-31 to 2015-03-27 and 2016-07-15 and 2016-10-01 to 02 and 2016-12-01 to 2017-03-24 and 2018-02-02 to 2018-03-23. Duration I. 15 min 30 sec. Commission / occasion I. Com­mis­sioned by the association Kluster in Luleå and Piteå (Swe) for the Resonans and New Directions Festival 2015 in Piteå (Swe), funded by Statens Kulturråd (The Swedish Arts Coun­cil) (Swe). Cologne version 2016: Free adaptation of the 1st version for the Cologne Saint Peter Art Center (Ger). Commis­sioned by the German organist Dominik Susteck for the festival orgel-mixturen 2016 in Cologne (Ger). II. Commissioned by the institution Norrbottensmusiken in Luleå/Piteå (Swe) for the New Directions Festival 2017 in Piteå (Swe), funded by Statens Kulturråd (Swe). III. Com­mis­sioned by the association Kluster in Luleå/Piteå (Swe) for the Resonans Festival 2018 in Piteå (Swe). b) two extra instruments: contrabassoon and tuba complementing the larger bass pipes. Timbrally, the piece investigates different levels and qualities of the organ tremolo. The old principle of the tremulant device (French: “tremblant”), i.e. the production of fluctuating sounds by manipulating the mighty air column inside the organ pipe, is extended and intensified with the help of preparations. Different external materials and objects, like sheets of paper, plastic and aluminium foil, rubber balloons, animal calls and party horns, are attached to a small selection of organ pipes, esp. larger bass pipes and louder reed pipes. 3,85% Winner of the project competition for a new work for the Acusticum Organ at Luleå University of Technology (Swe), 1/26 (2014-10). 4,67% Commission support from Statens kulturråd / The Swedish Arts Council (Swe), top-level, 5/107 (2015-11). 16,67% Project grant from the Nordic Culture Point / Culture and Art Programme (Fin), 29/174 (2018-11). 31,41% Mobility funding from the Nordic Culture Point (Fin), 60/191 (2017-11). 78,95% Performance funding from the project Ny(a)modigheter, initiated by MAIS (Collaboration of Music Organisers) (Swe), 15/19 (2017-10). duration: 15 min 29 sec.